These fish baskets aren't the kind that come with a few filets, tartar sauce and a side of french fries. Rustic, wicker creels (as they're called) hold an anglers catch while he keeps on fishing. 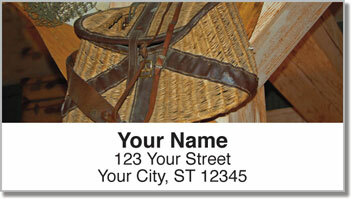 Creels provide a classic look for fly fisherman who know fishing is just as much of an art as it is a sport or a skill. 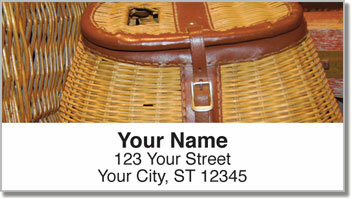 The baskets featured on this return address label design feature old-school creels made of wicker. 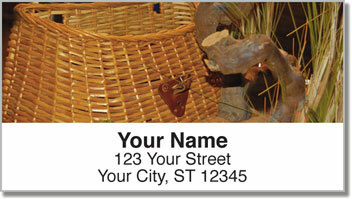 It's a timeless finishing touch for your letters and packages. This product will also make your life a little more easy-going. That's because you'll no longer have to scribble out your return addres on every envelope. Just peel and place thanks to a self-adhesive backing. 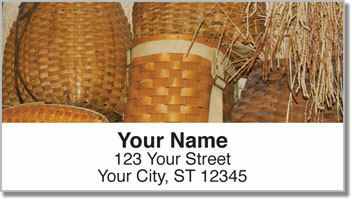 Order your own Fish Basket Address Labels now! Get them with matching personal checks.